The Sarah Palin storyline taking shape lately is whether the former Alaska governor, vice presidential candidate and Tea Party icon will run the president in 2012. Every move and word is scrutinized for clues about her future as she travels the country, offering support for Tea Party candidates, castigating President Obama, the GOP hierarchy and the press while raking in millions in her new media career. On Friday last week in Iowa, for a speech at the Iowa Republican Party's annual Reagan Day dinner, Palin was asked about her 2012 presidential aspirations. She was coy in her response. "I don't know," she said. "I know that you can make a big difference in America without even having a title, so I'm grateful for this opportunity." On Tuesday, however, SarahPAC, the political action committee authorized by Palin, released a video that makes it hard not to believe that she is making a 2012 run for the American presidency, or least seriously testing the waters wrapped in the Tea Party flag. The video is a highly produced campaign ad for the Tea Party movement. 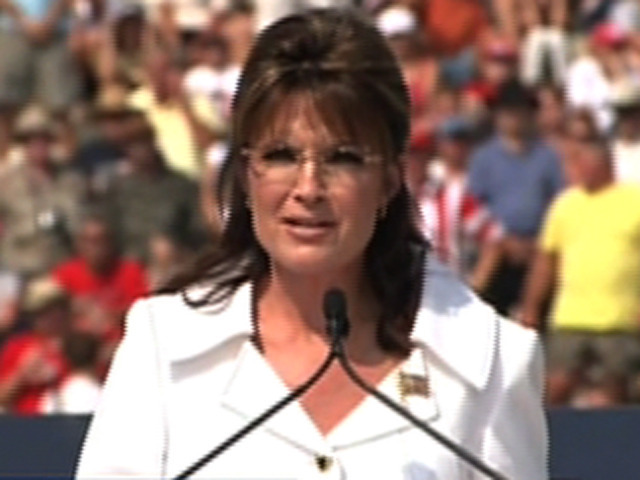 The one minute, 20 second video shows images of Palin giving speeches to large crowds, proclaiming that the Tea Party is "the future of politics," with "real people, not politicos" speaking out for "common sense conservative principles." The video leaves no doubt as to who is the leader of the Tea Party and the person trying to remake the Republican party as well. Sarah Palin Video Hails "Mom Awakening"